In the summer of 1992, the Soviet Union (as a Football entity) took its last breath during the 1992 UEFA European Championships in Sweden. The team managed by Anatoli Byshovets would be referred as CIS (Commonwealth of Independent States) for its last few months of existence. Ever since the Failed Political Coup in the Summer of 1991, the former Soviet Union had imploded into its separate Nations. 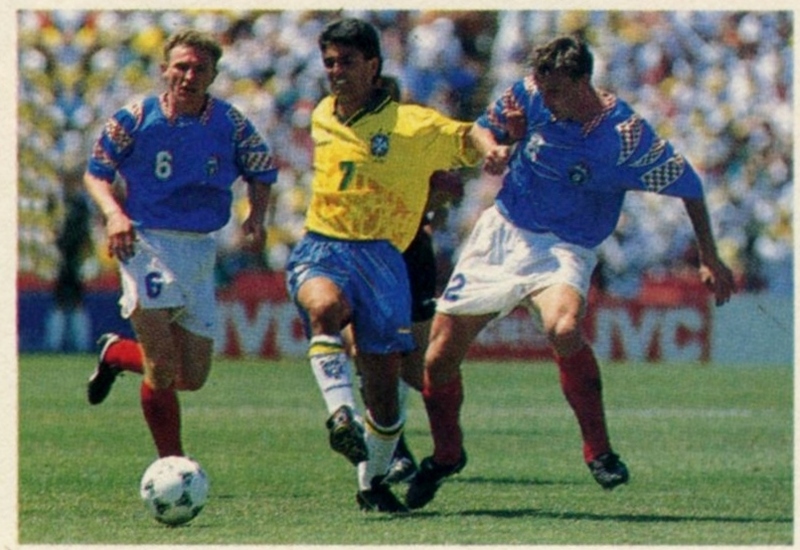 When the 1994 World Cup qualifiers started in the Fall of 1992. The place of the former USSR was now occupied by Russia (the largest confederation). There were some complaints that perhaps since the backbone of the Soviet Teams of the recent era were Ukrainian (mostly from Dinamo Kiev) perhaps Ukraine (and not Russia) should have been the Representative. However, as far as FIFA were concerned Russia were the recognized replacement of the old Soviet Union. 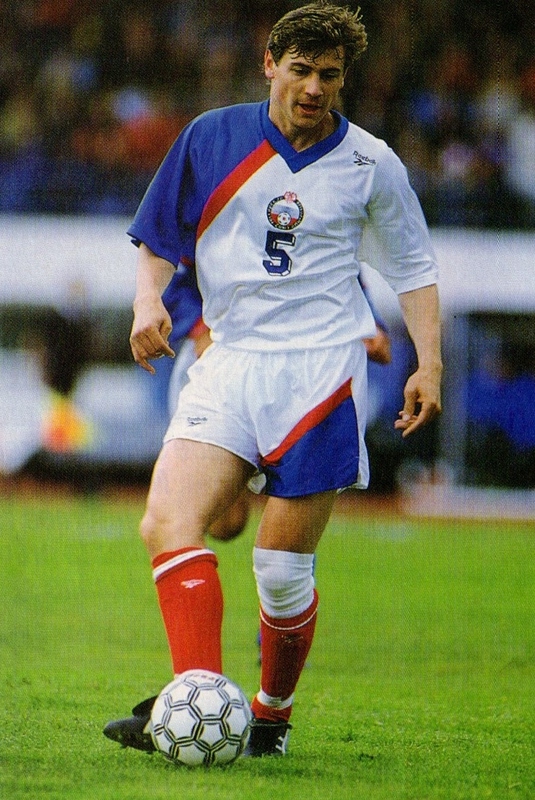 The new Manager appointed to lead Russia’s World Cup qualifying campaign was Pavel Fyodorovich Sadyrin. As a player he had lined up for Zenit Leningrad in the 60s and 70s. He had later been a Manager for the same club and had led them to the 1984 Soviet League Title. 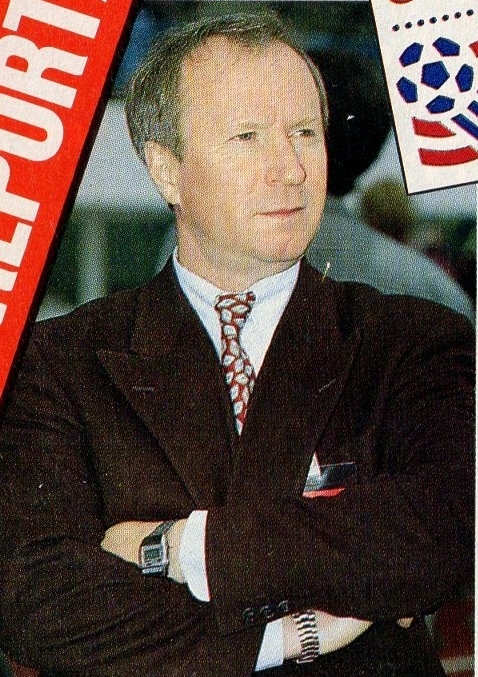 Afterwards he had managed CSKA Moscow and led them to the Domestic Double (League and Cup) for 1991. This last title certainly helped his appointment as Russia’s Manager. Unlike his predecessor Anatoli Byshovets, the last USSR Manager, Sadyrin was now constrained to a smaller player pool of Russian players only, now that the Soviet Union had broken up. FIFA had left it up to the individual players to choose their new International destination. 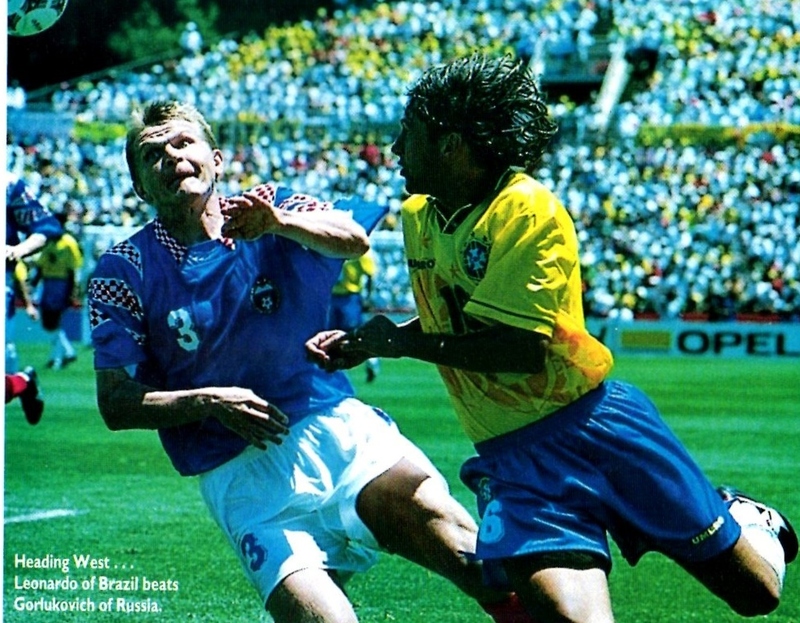 The possibility of perhaps a once in a lifetime opportunity to play in a World Cup, enticed many non-Russian former Soviet Internationals to opt for Russian citizenship to participate in the 1994 World Cup to be held in the United States. These included Manchester United’s Winger Andrei Kanchelskis (Lithuanian Father and Ukrainian Mother) and Estonian born Valeri Karpin. Other Ukrainians such as defender Viktor Onopko, as well as Yuri Nikiforov and Oleg Salenko (who had actually played in Friendlies for Ukraine) and Sergei Yuran also opted for Russian Nationality. Sadyrin could still call upon a core of Russian players (mostly based abroad) such as Igor Shalimov, Karlsruhe Sergei Kiriakov and Vassili Kulkov as a well as a large contingent from the Russian Team of the Moment Spartak Moscow. Their Qualification Group included Greece, Hungary, Iceland, and Luxembourg. Russia were seen as the Group favorites and their path appeared even easier since former Group member Yugoslavia had been banned from participating in the qualifiers as punishment for the escalation of their Civil War. This new look Team played its first match in a friendly vs. Mexico on August 17, 1992 (2-0 win). The last match from a Russian National Team had been before the First World War. The qualification Campaign started with two matches in the month of October against the Group’s weaker sides: Iceland on Luxembourg. A victory on October 14th at Moscow vs. Iceland (1-0) was followed by a (2-0) win vs. Luxembourg two weeks later at the same venue. 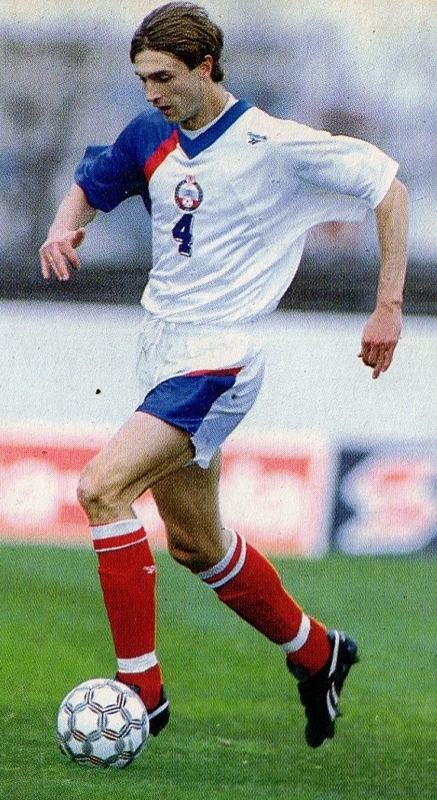 Russia continued with two new victories in the new year (April 1993) at Luxembourg (4-0 win, April 14th) and an important win at Moscow vs. Hungary (3-0, April 28th). By now it was a clear that it would be a race between the Russians and Greece for the leadership of the Group. The Russians hosted the Greeks in Moscow on May 23rd, 1993. The result was a diplomatic tie (1-1) for the teams that seemed headed to qualify without much difficulty. By now, the only question was which one would finish first in the Group. Just weeks later (June 2nd) Russians sealed qualification with another tie (1-1) at Reykjavik vs. Iceland. The final matches in the Group were a formality. 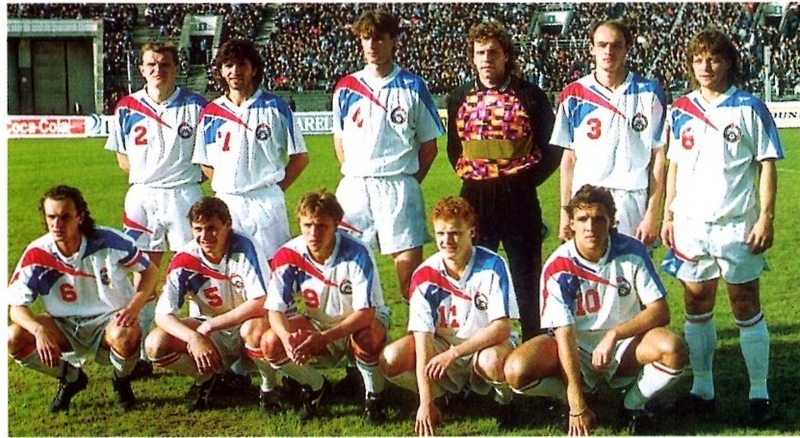 A comfortable win (3-1) over Hungary at Budapest on September 8th set the stage for the somewhat inconsequential final qualifier vs. Greece at Athens on November 17th, 1993. In a disappointing match for the Russians, they would lose (0-1) and qualify as the second best in the Group (in addition, Onopko was sent off near then end). The qualification process had been comfortable in a not too difficult Group, but the Russians had generally not impressed. It was the events following this final qualifier vs. Greece that would lead to a rebellion of the senior players against the Manager Pavel Sadyrin. Sadyrin had not helped matters by blaming the result on foreign-based players such as Shalimov, Yuran and Kiriakov. Tensions were already high, as the Referee from Gabon, Jean Fidele Diramba, had ruled out a last minute equalizer from Igor Dobrovolsky. At the conclusion of the match, the Russian Federation President Vyacheslav Koloskov stormed into the dressing rooms and criticized the players for their performance. This act sent the players over the boiling point, already disappointed with the events in the last minute of the match. The players defended themselves and argued with Koloskov. During these arguments, Koloskov also disclosed that the Russian Federation had signed a contract with ‘Reebok’ for the World Cup (on the players behalf) and all the players were to adhere to the contract and play with their boots. This further enraged some of the players who already had personal contracts with other sponsors for their boots. Apparently National Team Manager Sadyrin had been aware and on board with this deal and this further widened the rift with the rest of the squad. Igor Shalimov later disclosed it was at this moment that he knew Sadyrin was not on their side and on the side of the Federation. Back at their Hotel, the Hilton in Athens, the players convened in one of the rooms to discuss a course of action. The coaching staff were informed of this gathering. Assistant Manager Yuri Semin spoke with the players in the hope to diffuse the situation and mend fences but the players were inconsolable and it was to no avail. Shalimov would later admit that in their team discussion he had proposed the idea of writing to someone with authority to air their grievances. He thought of his friend Tamil Tarpischev, the Presidential Sports Advisor, since he had access to President Boris Yeltsin. Upon their return to Moscow the next day, fourteen players signed an open letter that was published in Newspapers and directed to Russian President Boris Yeltsin. 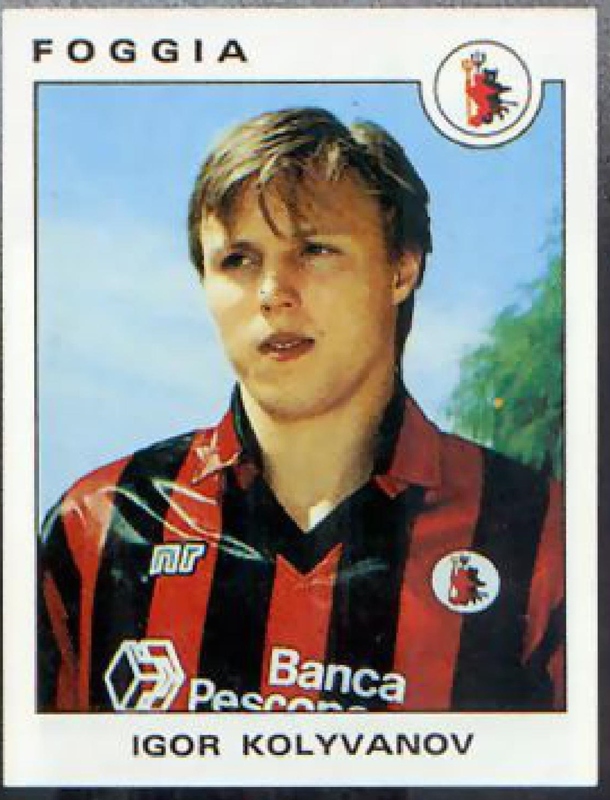 The players in question were: Igor Shalimov, Igor Dobrovolsky, Sergei Kiriakov, Andrei Kanchelskis, Yuri Nikiforov, Valeri Karpin, Andrei Ivanov, Sergei Yuran, Igor Kolivanov, Viktor Onopko, Dmitri Khlestov, Oleg Salenko, Vassili Kulkov and Alex Mostovoi. The original letter was signed by eleven players. 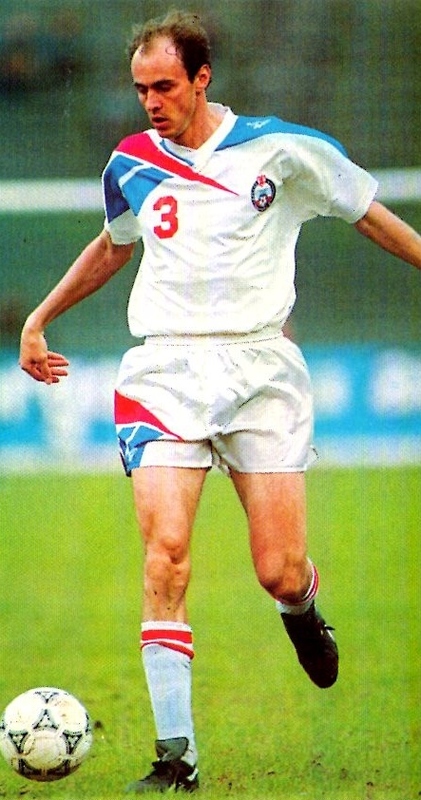 Andrei Kanchelskis had not been present since he was suspended for the match vs. Greece; however, he faxed his signature over after a phone call from Shalimov. Spartak Moscow pair of Valeri Karpin and Andrei Ivanov (also not present in Greece) signed the letter once in Moscow. Others present in Athens who did not sign the letter were Dmitri Galyamin , Dimitri Kharin, Stanislav Cherchesov, Dmitri Popov and Dmitri Radchenko. After all the signatures were collected the letter was officially submitted to Tamil Tarpischev. 1-The return of Anatoli Byshovets as Head Coach to lead the team in the World Cup. 2-The Modifications of the financial bonuses for qualification and also for the Finals. 3-Immediate improvement in Organization and Logistics related to the Team. The players believed to improve the team’s performance especially in the World Cup, these issues needed to be addressed and resolved. The Federation was blamed for its Mismanagement and Organizational Errors, Financial Manipulation and general poor logistics and training conditions. They also questioned the competence of Head Coach Pavel Sadyrin. They dismissed him as just ‘a good club coach’ but who was out of depth in the International Arena and still reliant on out-dated methods of training. They even credited their qualification on the previous USSR Manager Anatoli Byshovets. They felt that Byshovets had laid the groundwork for this current team during the 1992 Euro qualifiers and not Sadyrin. There are multiple reasons why this extreme step was taken at a time when one would have thought the players and Federation would have been basking in the glory of qualification and let bygones be bygones. There were similarities to the situation with the Dutch National Team from just a few years prior. Upon their qualification for the 1990 World Cup, the Dutch led by stars such as Ruud Gullit and Marco van Basten had led a rebellion to oust the Manager Thijs Ligbrets. They succeeded in doing so and this precedent perhaps emboldened the so-called Russian ‘Refuseniks’. There were many players who felt Sadyrin’s methods were too dictatorial. Many of the players also were antagonistic towards Sadyrin for his tendency to always side with the Federation for various matters, in contrast to Byshovets who apparently sided with the players. Sadyrin’s problems with the players was not limited to the foreign-based contingent, the Spartak Moscow players were also seemingly opposed to him. As far as their hostility towards the Federation officials, it also came to light that in their Training Camp at Novogorsk for days (before their final qualifier vs. Greece) the heat had been switched off. The extreme cold had forced the players to sleep with their coats on. It was also reported around this time, former USSR Manager Anatoli Byshovets had delayed his departure to South Korea (on his way for a coaching position) as he felt he might be appointed in time for the World Cup. It later transpired that Shalimov had contacted him about their plans and their preference for him to manage them. Upon the onset of this act of defiance (or insolence depending who you ask), the Russian Federation and its President Vyacheslav Koloskov, along with the Sports Ministry, backed Sadyrin and denied these charges. Sadyrin famously remarked "In the whole civilized world, the coach picks players, not the other way around." On December 6th, 1993, Sadyrin accused Byshovets of having masterminded the letter to oust him. Sadyrin believed that most players signed the letters without realizing its full contents. He believed the players thought the letter contained financial and bonus related details (and not his removal). By the new year (1994), it was appearing unlikely that Byshovets would be appointed. In January, Byshovets contacted Shalimov, informing him of his offer in South Korea. He told him he would not take the offer without the consent of the rest of the squad. In the end he would go to Korea since iit seemed unlikely that Sadyrin would be removed. On January 21st, Nikita Simonyan, The Deputy Federation President, declared that the 14 rebels would be expelled and denied from participating in the World Cup unless they dropped their demand for the dismissal of Sadyrin. Sadyrin started preparations by calling up 45 players for a meeting in Moscow to discuss the World Cup preparations. Of those summoned, only 26 showed up at the meeting on January 25th. The core contingent of the rebels still held out. Igor Shalimov, along with Dobrovolsky, Mostovoi, Kiriakov, Ivanov, Kulkov and Yuran made their position clear at a Media Conference at the Russian Ministry of Foreign Affairs in Moscow. They were accompanied by Tamil Tarpischev and Vitali Smirnov, the Russia Olympic committee President. Russian Federation President Vyacheslav Koloskov continued his unwavering support for Sadyrin and blamed ‘Shalimov and his friends’ for being greedy. Koloskov felt the coaching dispute was just an excuse and smokescreen to seek more money. He also warned that FIFA might replace Russia with Australia if this matter was not resolved (difficult to say if he was honest or bluffing). Sadyrin took a weakened and mostly experimental squad on this tour of North America in late January. They tied USA on January 30th (1-1) and defeated Mexico (4-1) on February 2nd. Oleg Salenko, who was one of the 14 rebels, was included on the tour and became the first of the rebels to make peace. Many would view this as an act of betrayal and disloyalty. After the win over Mexico, Sadyrin said: "This is the group of players to whom I'll put my faith. There are enough first-class players in Russia." In an Interview on February 19th, Sergei Yuran became the second rebel to come back to the fold. The rebellion seemed to be subsided after the Byshovets possibility appeared to be a dead issue. As far as financial incentives, a bonus fee of £70,000 was negotiated (for winning). In the meantime, Russia played a preparation friendly vs. the Republic of Ireland on March 23rd at Dublin that ended scoreless. On April 4th, the Federation declared an ultimatum that by April 8th; the remaining rebels must accept Sadyrin as Manager. There were rumors that Spartak Moscow Manager Oleg Romantsev might replace Sadyrin in the last minute. Despite having large support from his club contingent this course of action did not materialize. 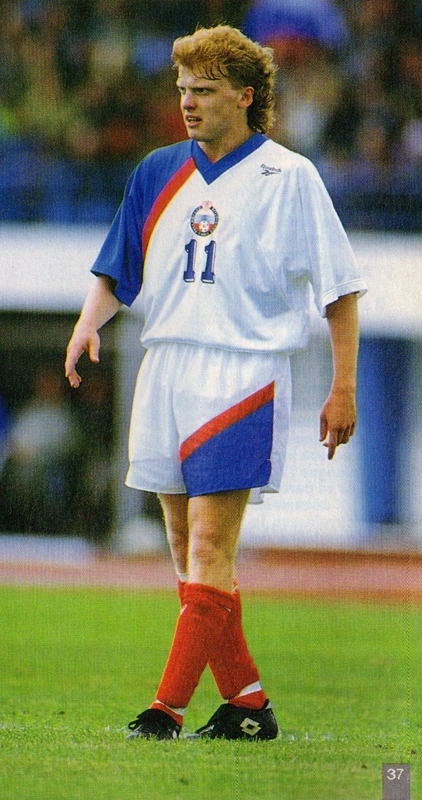 Romantsev was credited for convincing some of the Spartak Moscow ‘Refuseniks’ to rejoin the National Team. He told them that everyone must decide on their own if they would like to rejoin. Spartak duo of Yuri Nikiforov and Viktor Onopko would be the next rebels to return to the National Team. The duo along with Yuran lined up in Russia’s friendly win (1-0) over Turkey at Istanbul on April 20th. Afterwards, Alex Mostovoi and Spartak Moscow’s Dmitri Khlestov also rejoined the squad. 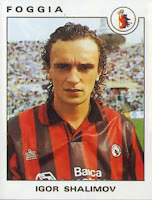 The seventh and last ‘Refusenik’ to rejoin the squad was Spartak Moscow’s Valeri Karpin on May 20th. The Russians along with some of the returnees played their final friendly on May 29th vs. Slovakia (2-1 win) prior to departure for America. From the original 14, Salenko, Nikiforov, Karpin, Yuran, Onopko, Khlestov and Mostovoi were back. There were seven remaining players who still would not compromise. Shalimov and Dobrovolsky (the ringleaders), as well as Kanchelskis, Kiriakov, Ivanov, Kulkov and Kolivanov. Sadyrin now with a stronger hand expressed that a compromise might still be reached with Kanchelskis and Kiriakov but no relationship could be established with Shalimov and Dobrovolsky. In the end the remaining seven maintained their position and missed out on the World Cup. The World Cup was a disappointing one for the weakened Russian side. A defeat against eventual World Cup winners Brazil on June 20th (0-2) was followed by another disappointing loss vs. Sweden (1-3) on June 24th and they were eliminated. There was another instance of indiscipline with one of the former rebels when Sergei Yuran fell out with Sadyrin once again and missed a training session. He was sent home by the Russian Federation. The only bright spot for Russia in this World Cup would be in their final inconsequential group match vs. Cameroon on June 28th. 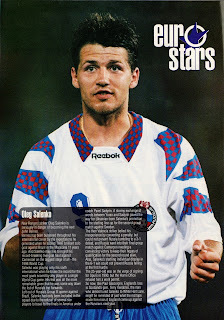 Former Rebel and the first returnee Oleg Salenko entered the history books by scoring five goals in Russia’s win (6-1). Along with the goal he had scored vs. Sweden, he became the joint top goalscorer of the World Cup with six goals. He may not have even played had Yuran not been axed from the squad. This World Cup ended a sad chapter for Russian Football and immediately afterwards Pavel Sadyrin resigned form his post. Russian Federation President Koloskov who had supported him throughout praised Sadyrin for his courage and patriotism. There were many reasons as to events reached to such a point where a rebellion was deemed necessary by the players. The mismanagement and lack of organization on the part of the Federation appears to be theme that most would agree on. Igor Shalimov would further highlight these problems by recounting stories on how some of the foreign-based players were stranded at airports and/or left on their own devices to meet up the squad during away matches. Koloskov’s excuse for such instances was that due to growing pains of a then-new Nation they still had to learn and adapt. A Nation steeped in communism for over seventy years now had to suddenly compete in a new Capitalist World where they had to survive on their own. The players were also suddenly in this world of the West and were suddenly faced with dealing with money and sponsorships. These players also witnessed freer forms of expressions displayed by their Western colleagues and were encouraged to speak out. It is also possible that Sadyrin, brought up in the rigid system of the old Soviet Union, was not accustomed to an era of player power and openness. In hindsight, many also believed that perhaps Koloskov had been too hasty in attacking his own players following the match vs. Greece. He had made an already volatile atmosphere worse with his tirade. Perhaps, all the parties involved should have waited a few days and then discussed the problems in calmer circumstances. In addition, the Federation should have been more transparent in their agreement with Reebok and not deal behind the players’ backs. This clearly rubbed the players the wrong way and the perceived complicity of Sadyrin also irrevocably damaged his relationship with the squad. Koloskov would later defend the decision to sign with Reebok (for the boots) by pointing out that they were the only sponsors who paid the National Team money and provided outfits. They were also bound by a contact via the Russian Olympic Committee, as Reebok supplied the kit for all the sports. If accurate that appears to be a reasonable line of action, however, the squad should have been informed and in the loop. 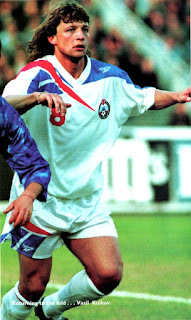 Dmitri Galyamin was one of the players present in Greece on that fateful day that did not sign the letter. He would later disclose that he agreed with the players’ demands as far as the organizational (or therelackof) but did not agree with the replacement of Sadyrin. Perhaps had the players limited their demands to the organization/bonuses and not the coaching change, the Officials would have met the players halfway. What is surprising is the course of action by players, for whom, this might have been the only opportunity to play in a World Cup. Even more surprising, the fact that some players involved (ex. 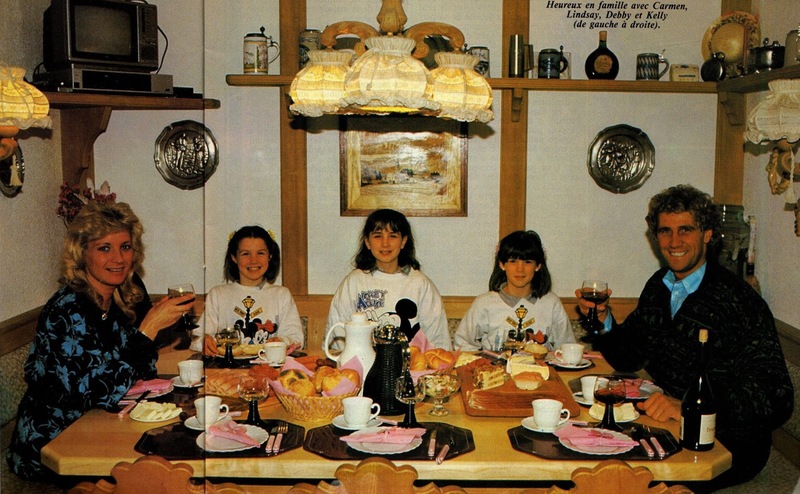 Kanchelskis, Onopko, etc) had obtained Russian Citizenship solely for that purpose. The Dutch precedence in 1990 perhaps encouraged them, however, the lesson of the Dutch was not completely learned. Because even after they succeeded in their Coup, the Dutch were a shadow of their former selves and a demoralized squad performed poorly on the World Stage. It must also be remembered that the Dutch Mutineers had more clout, as they contained two ‘Ballon d’Or’ winners (Gullit/van Basten) as well as a host of Internationals that had won the Champions Cup and more importantly the 1988 UEFA European Championships. Koloskov would later express regret that they had negotiated and convinced a number of the rebels to come back. He felt this backfired as more tensions were sawn between the rebels and players who had stayed loyal to Sadyrin. It was reported that there was disunity and friction within the squad that when Salenko scored against Sweden in the World Cup, only one of the Russian Substitutes celebrated because the substitutes were envious of the starters. After the World Cup, Oleg Romantsev of Spartak Moscow was appointed as the new Russian Manager. He was the popular choice as he had managed many of the players at the club level and had the respect of the playing staff. He combined the jobs of managing his club along with the National Team. The remaining rebels would slowly return to the fold, except surprisingly top goalscorer Salenko (whom many viewed as a traitor). Pavel Sadyrin would return to club Football and manage his old clubs Zenit (St. Petersburg) and CSKA Moscow (in two separate spells). He also had a stint at Rubin Kazan. He passed away due to cancer on December 1st, 2001 aged 59. A ‘Refusenik’ was actually a term used to describe Soviet Citizens during the Communist era who were denied permission to emigrate by Soviet Authorities. 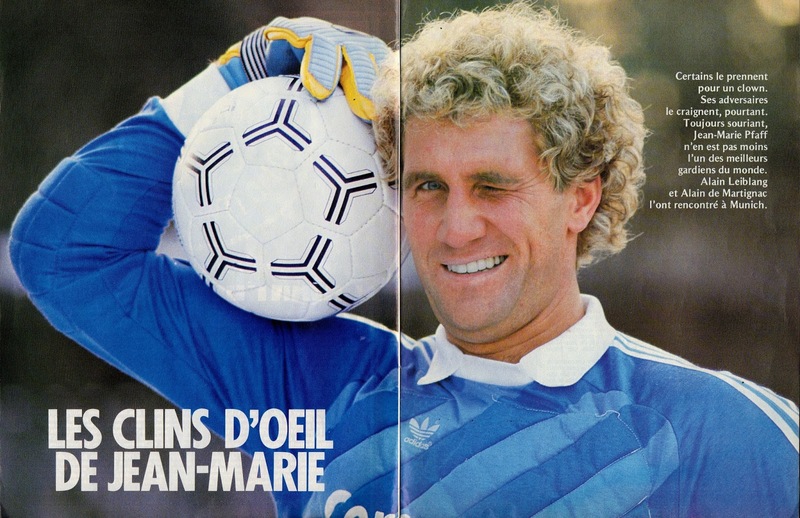 In a profession known for its cold hard realism, Belgian goalkeeper Jean-Marie Pfaff was an anomaly as a bon vivant. 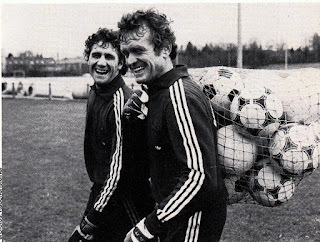 In the 1970s and 1980s, goalkeepers were sober and serious characters epitomized by his contemporaries such as Dino Zoff, Peter Shilton and Rinat Dassayev. In contrast, Pfaff was a clown all too eager to please and entertain the fans. However, his bubbly personality and demeanor on the field contrasted sharply with his dedication to hard work and training off of it. The public generally loved him, yet some segments of the Press as well as his fellow professionals viewed him with suspicion and distrust. Pfaff was born on December 4th, 1953 at Lebbeke near Antwerp. He lived in poverty with a large family consisting of twelve siblings (Six boys and Six girls, he was the 10th child). The family lived in a caravan travelling from city to city selling rugs. His father was killed in an automobile accident when he was eleven. At this point, he believed he could have turned into a delinquent had it not been for the support of his large family. Football also played a part in keeping him in a positive path. 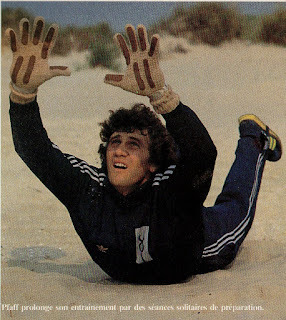 From a very young age, The Game was in his blood and especially the role of the goalkeeper. It was the sport that would take him out of a life of poverty. He joined the youth set up of nearby club SK Beveren on June 21st, 1965 as an eleven-year old. He was (according to himself) short and overweight. The Management would work on his diet and worked him very hard in shaping the youngster and in time he would lose the weight and have a growth spurt. His visible talent at such a young age would enable to move up the ranks. He was even called up by Belgium’s UEFA Juniors squad while at schoolboy level. He would abandon school at the age of 14 to be fully dedicated to succeeding as a future professional. 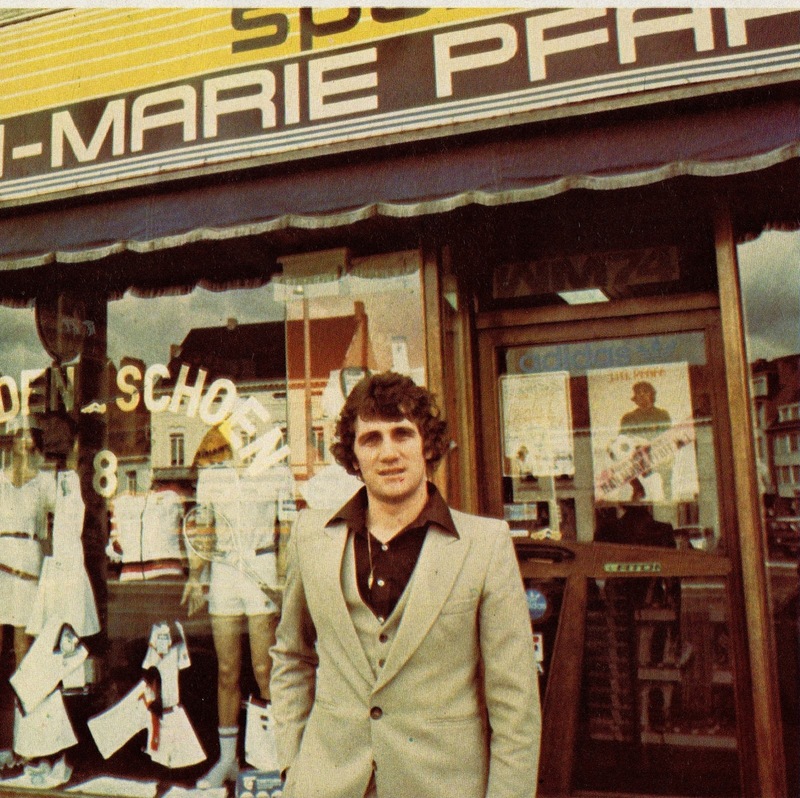 The eighteen-year old would get his chance to make his debut for the Beveren’s first team on April 9th, 1972 in a League match vs. Crossing Schaerbeek (1-2 loss). He would play a handful of matches in the season, but Beveren would be relegated at the end of the season. 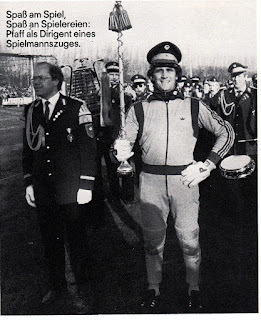 The following season (1972/73) in the Second Division, Pfaff would be elevated as starting goalkeeper and help his team win immediate promotion by winning the Second Division title. 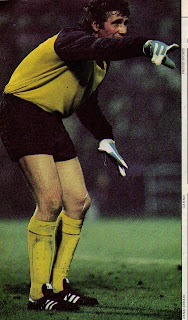 The following season (1973/74) would be Pfaff’s first as a starter in top flight. Beveren finished in the tenth position, but Pfaff’s performances were not going unnoticed and his stature was growing as a future heir apparent to Belgium’s Number one Christian Piot. For the time being, National Team Manager restricted Pfaff as a substitute goalkeeper behind the untouchable Piot. Goethals was still not convinced by the talented youngster and felt he was still lacking in certain areas (especially in the air). At the end of that first full season on June 27th, 1974, Pfaff married Carmen Seth who would not only be his spouse, but also play a larger role in his career. She would act as his Manager and provide him the much needed support and peace of mind that a sportsman needed at home. They would have three daughters, the first one Debby would be born on May 30th, 1975. Her sisters Kelly and Lyndsey would be born on July 26th, 1977 and October 4th, 1978 respectively. 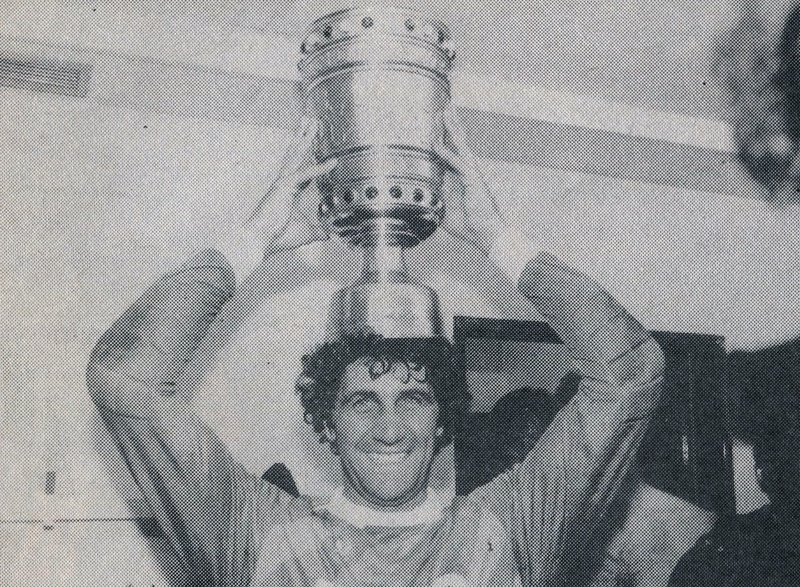 The following season (1974/75), with Jef Jurion at the helm, the team fared worse by finishing in the 12th position. Jurion trained him with the outfield players to strengthen him. Jurion did drop Pfaff for a number of matches. 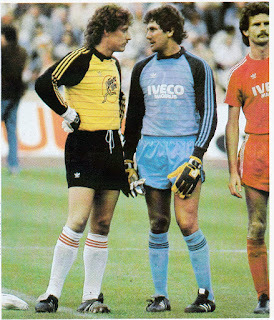 Fortunately (for Pfaff) Jurion was replaced after this poor season and replaced with Urbain Braems. Braems would once again install Pfaff as the starter for the new season (1975/76). The appointment of Braems would be a turning point in Pfaff’s progress. Braems also worked him very hard and prepared him for the next step. Pfaff would look upon Braems as his spiritual father and would be thankful of his influence for the rest of his career. He would manage him on three separate occasions. It was under his tutelage that Pfaff finally received his long awaited first cap. 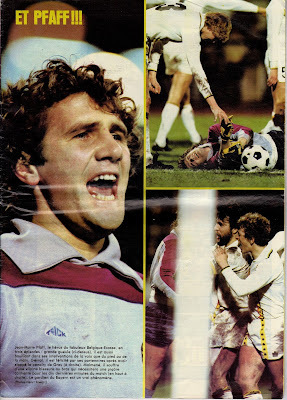 This season (1975/76) would be the turning point for Beveren and Pfaff. The Team under Braems finished in the sixth position. After being an understudy for the nearly two years Pfaff was handed his National Team debut towards the end of the season. The Belgians had been virtually eliminated from the Euro Quarterfinals by archrival neighbors Holland, just weeks earlier (April 25th) in a humiliating (0-5) loss. Raymond Goethals had resigned and the new man in charge was Guy Thys. Thys saw the need in rebuilding an ageing side and decided to inject new blood into the squad. 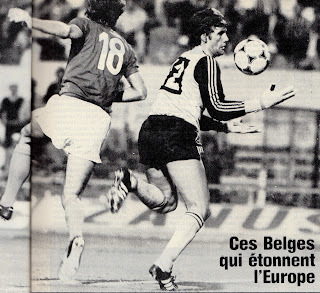 Pfaff started in goal, instead of Christian Piot, for the return leg of this qualifier in Brussels on May 22nd, 1976. Belgium lost once more (1-2) but Pfaff was involved in an incident that would raise eyebrows. 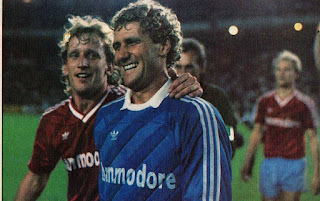 After the Great Johann Cruyff had scored on him with a beautiful lob, Pfaff had congratulated him. His action was seen with certain cynicism from the press who were baffled by his motives. Pfaff insisted that his actions had been misinterpreted. He maintained that he wanted to congratulate him because it had been a beautiful goal and he was acting sportsmanlike. This was just one incident that perhaps confirmed his reputation as a difficult character. Pfaff believed that it was another incident from which the Press falsely attached him the ‘difficult’ tag. Pfaff claimed that in his early days in the National Team he was the sole Beveren player. Most players were from the Big three clubs (Anderlecht, Standard Liege and Club Brugge). According to Pfaff, the players from those clubs did not mix with others and stayed together (played cards, etc). As a result, one day in the training camp with the National Team, he grew tired and started going out walking and jogging in the vicinity. A reporter saw him and started asking him questions and according to Pfaff falsely deduced that there was trouble within the camp with him and others and reported it. 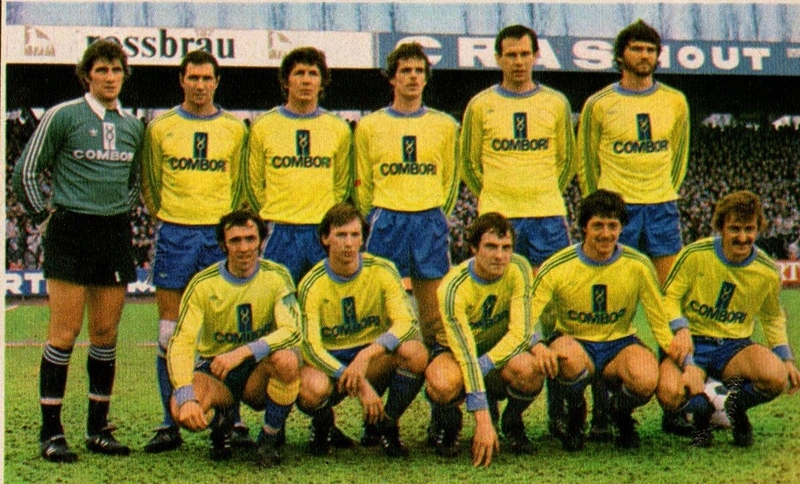 The next season (1976/77) Beveren struggled in the League and finished in the bottom half. 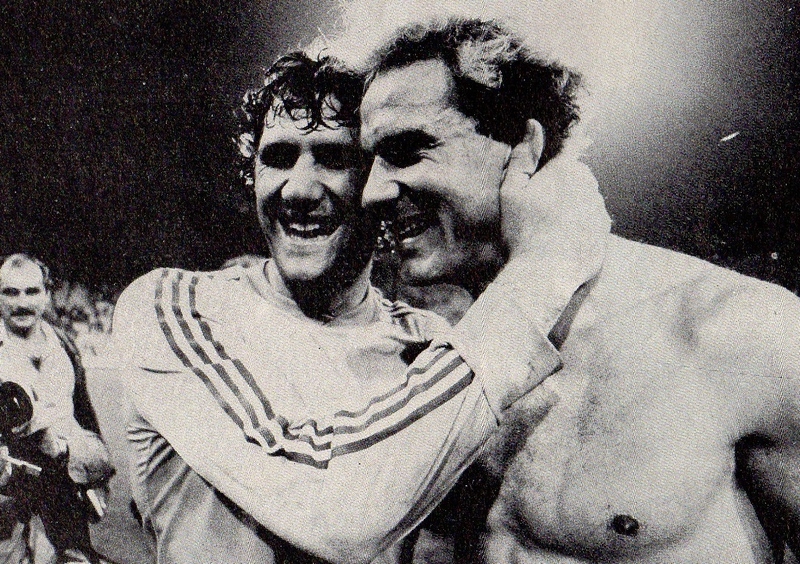 At the National Team Thys kept faith with the more experienced Piot as the World Cup 1978 Qualifiers got underway. 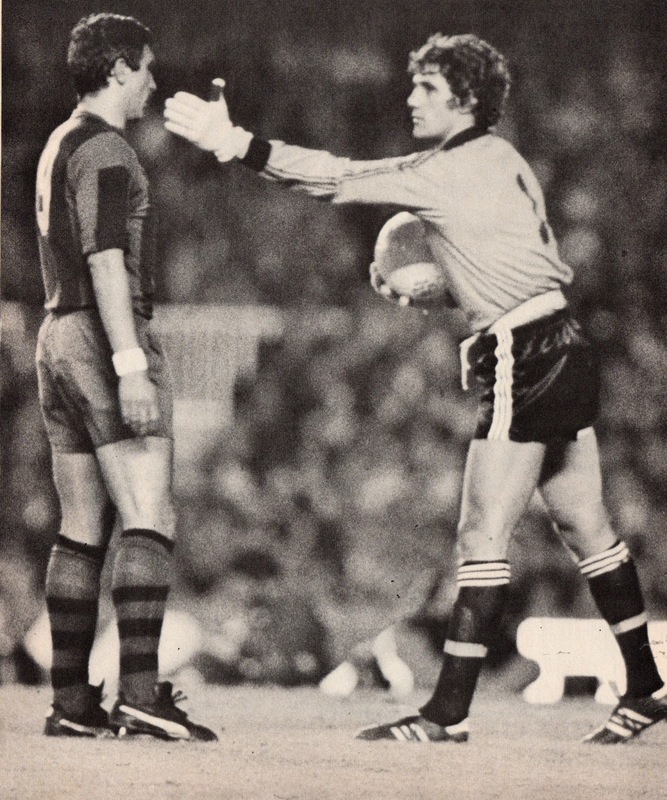 For the (1977/78) season, Thys elevated Pfaff as the starting goalkeeper after Piot retired from the National Team. It was a memorable season for the Team as they finished fifth in the League. 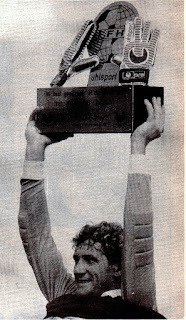 Pfaff won his first major silverware as Beveren triumphed in the Belgian League after defeating Charleroi (2-0) on May 21st, 1978. His growing stature was underlined when at the end of the year he was elected as ‘Soulier d’Or’, Belgium’s player of the year. He became only the fourth goalkeeper to do so. He had grown into a goalkeeper known for his excellent reflexes and his ability to launch attacks with quick throws. The main criticism about his game was mostly about the mental aspects. 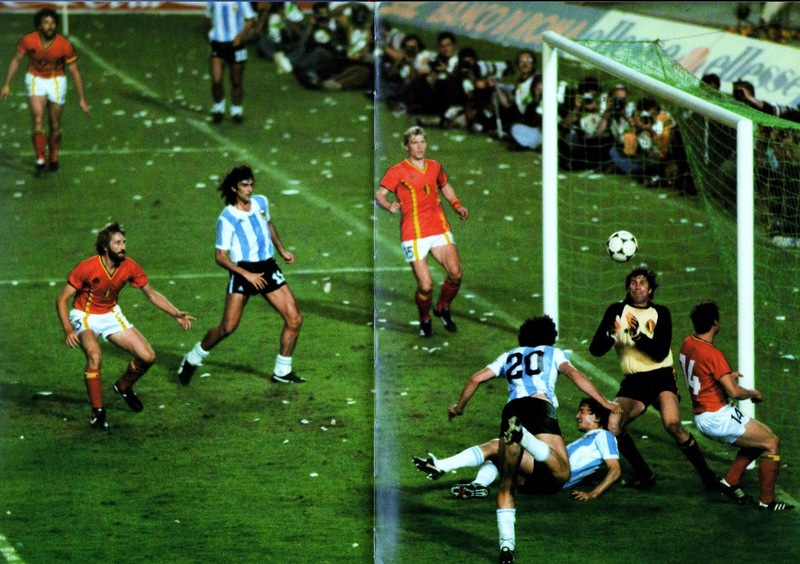 He was seen as too reckless and impatient which would lead to mistakes most notably in coming out of line too soon (as would be witnessed later during the 1982 World Cup vs. Hungary). However, winning this award also brought out the publicity seeking aspect of his character. For starters he started wearing a necklace of the ‘Soulier d’Or. He also tried to exploit publicity of his award in his Sports Shop, to such an extent that the organizers of the trophy threatened a lawsuit on the grounds that it was ‘unlawful usage of a product’. 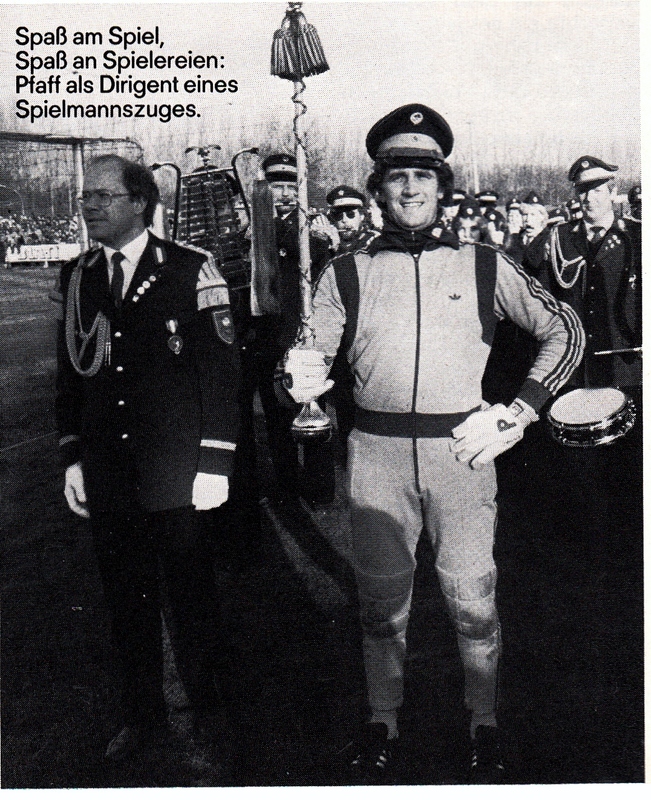 The following season (1978/79) would be Pfaff’s most successful yet. The man responsible for his ascension Urbain Braems had left the club after winning the Cup Title. The new man in charge at Beveren was Robert Goethals. 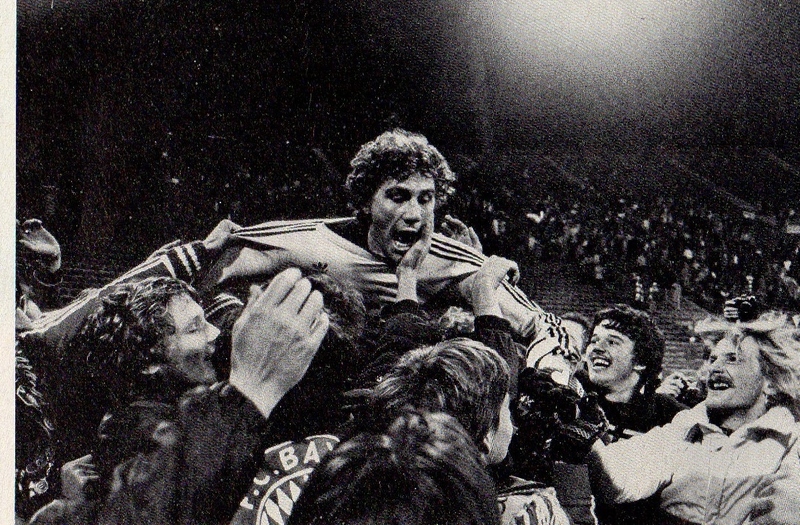 The small unfashionable squad beat all odds and ended up as Champions of Belgium (Pfaff’s first League title). 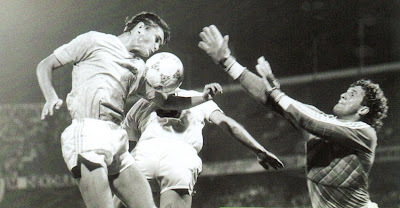 In Pfaff’s first foray in a European Competition, Beveren reached the semifinals of the Cup Winners Cup before being eliminated by eventual winners Barcelona. His affairs were being managed by his wife Carmen who had to contend with a flurry of offers from the likes of Anderlecht, Ajax, Feyenoord, Schalke, Twente Enschede and AZ’67 Alkmaar among others. 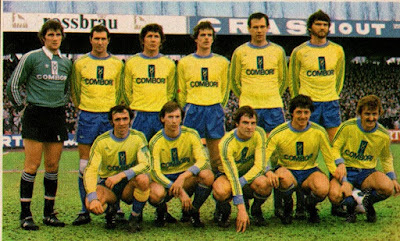 He stayed put at Beveren for the new season (1979/80) but Beveren were unable to maintain the previous seasons’ successes and struggled and finished mid-table. They did reach the Cup Final but were deprived of any silverware after losing to Waterschei (1-2) in the Final. Pfaff also lost his starting position at the National Team to Theo Custers as Belgium qualified for the 1980 Euros. Into the spring of 1980, Custers was the starter and looked likely to be the starter at the Euros. However, just before the Euros, Thys opted to start with Pfaff. 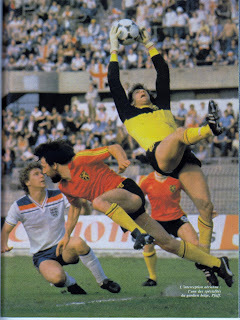 West Germany defeated Belgium (2-1) in the Final, but Pfaff and Belgium’s star was on the rise in the International Level. He was now firmly established as Belgium’s number one and in addition was now considered as one of the continent’s best. 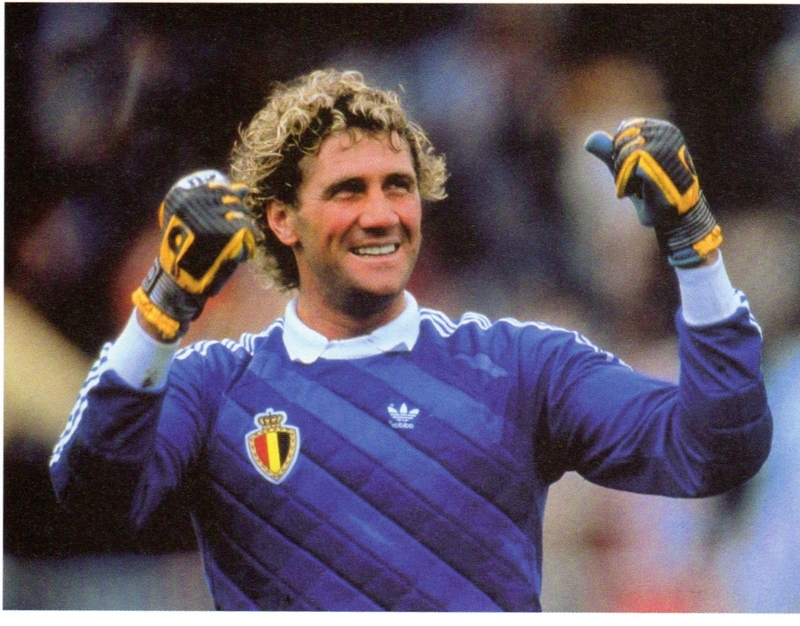 Away from the field he was showed his business acumen by a running a Sports Goods Shop in Beveren and developed a glove specially designed for wet conditions. He also ran a goalkeeping school for the young in Beveren. The following season (1980/81) was a difficult season for Pfaff. He started well as Belgium started their qualification for the 1982 World Cup in a tough group containing their Dutch neighbors, France and Republic of Ireland (as well as Cyprus). Although Beveren did well that season (finishing Fourth), Pfaff would miss the majority of the second half of the season as he was serving a four months suspension (Until June 30th, 1981). He was accused of kicking a Linesman on the way to the dressing rooms in a Belgian Cup match on February 21, 1981 vs. Lokeren (2-2). There were no witnesses but the Linesman in question (Mr. Thirion) had made a note of the incident and Pfaff was suspended. In his absence in springtime, Belgium suffered their first loss in the qualifiers vs. France (2-3) on April 29th, 1981, with Michel Preud’homme starting in Pfaff’s place. Pfaff would be back the following season (1981/82) as Belgium qualified for the World Cup. It would also be his last season with Beveren (finishing Seventh with Urbain Braems back at the helm) ending an association of nearly 17 years. The main event for that end of the season would be the World Cup in Spain. This World Cup would display both sides of Pfaff’s personality. He would be as indispensable on the Field as he was controversial off of it. Belgium played in the Opener vs. Defending Champions Argentina on June 13th at Barcelona. Naturally all the attention was on the new superstar of World Football Diego Maradona. But it was Pfaff who outshone the Argentine on the field as he had an impeccable match in Belgium’s upset (1-0) victory. He was equally remarkable in Belgium’s next match vs. El Salvador, which yielded another (1-0) win. 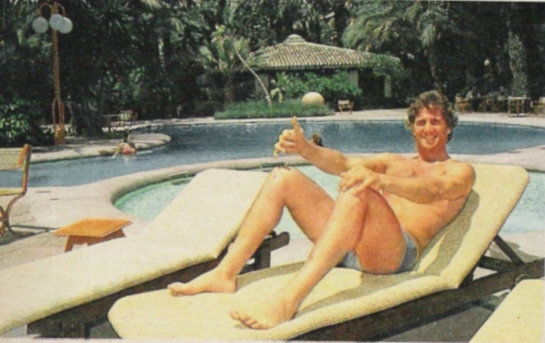 During a team get together with the Press at their Hotel ‘Huerto del Cura’, a Radio Commentator had pushed Pfaff in the swinning pool as a prank. Pfaff started panicking because apparently he couldn’t swim. To many he had made such a big fuss and ‘pretended’ to be drowning. In another incident he had called the Police after he had seen someone enter teammate Rene Verheyn’s room (It turned out to be Verheyn’s wife). Their next and Final match in the Group would be the crucial one vs. Hungary on June 22nd. Belgium came away with a (1-1) tie that they needed to qualify, but it was Pfaff’s performance on and later off the field that would end his World Cup. 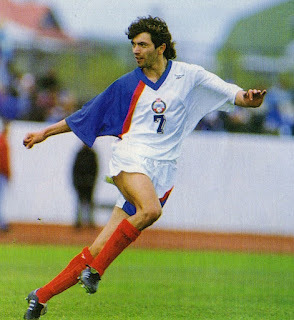 In the 55th minute of the match, he came out to intercept a cross, destined to Hungary’s Andras Torocsik, with such ferocity that he struck his teammate Eric Gerets and injured him in the process. Later on, he also nearly injured Hungary’s Laszlo Fazekas in rushing out for s similar attempt. It was obvious that the previous days’ events were getting to him and affecting his game. In the meantime, an ambulance had been called to take Gerets to the hospital. The ambulance arrived after the match, however, Pfaff got in there first because of a dubious shoulder injury, so Gerets was forced to stay behind in anger with the rest of the squad. The shoulder injury turned out to be a very minor one. This behavior enraged Thys (along with the rest of the squad) and he took the decision to to drop Pfaff for the remainder of the World Cup. Belgium lost both their matches in the second Round without Pfaff to Poland (0-3, with Custers in the net) and the Soviet Union (0-1 with Jacques Munaron in the goal). A Belgium Federation Official Mr. Ruiter described Pfaff as an immature child who only sought publicity. After the World Cup, Pfaff joined the mighty West German powerhouse Bayern Munich in the Bundesliga for a fee of £225,000. He was eager for a bigger stage and Bayern seemed ideal. He had declared that he had already won the League title and the ‘Soulier d’Or’ in Belgium and was now ready for the bigger stage of the Bundesliga. Since the retirement of the Great Sepp Maier a few years before (one of Pfaff’s idols in addition to Lev Yashin and Gordon Banks), they had not found a suitable replacement in Walter Junghaus (deemed too inexperienced) nor Manfred Muller (considered to old). Pfaff appeared the International quality goalkeeper they were looking for (as well as having a sense of humor reminiscent of Maier). He would later reveal some of the difficulties as he arrived such as not speaking the Language and the fact that Manfred Muller and Raimond Aumann (the other goalkeepers) were visibly opposed to his arrival. Pfaff received a rude awakening in his baptism in the Bundesliga on August 21st, 1982 vs. Werder Bremen after letting in a comical own goal. Bremen’s Uwe Reinders took a long throw in from the left side towards the goalmouth, Pfaff only managed to touch it with the tip of his fingers and the ball went in the net. Needless to say, the Media was merciless as they questioned the sum paid for his services after such a comical goal. Afterwards, the Media also analyzed his every move and every decision during matches. Such was Pfaff’s mental strength that he slowly earned his way back and won over the Bavarian crowd with solid displays. The Turning point for him was in a match vs. Defending Champions SV Hamburg on October 9th. Hamburg had taken a (2-0) in Munich and appeared headed for win. Bayern clawed their way back and tied the match (2-2) in the 89th Minute. 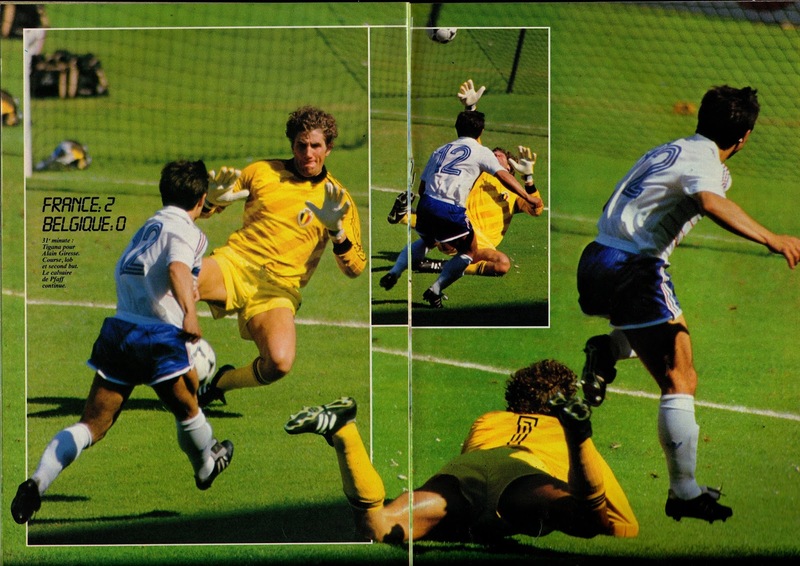 However, moments later Hamburg were awarded a penalty kick after Udo Horsmann had fouled Jurgen Milewski in the box. 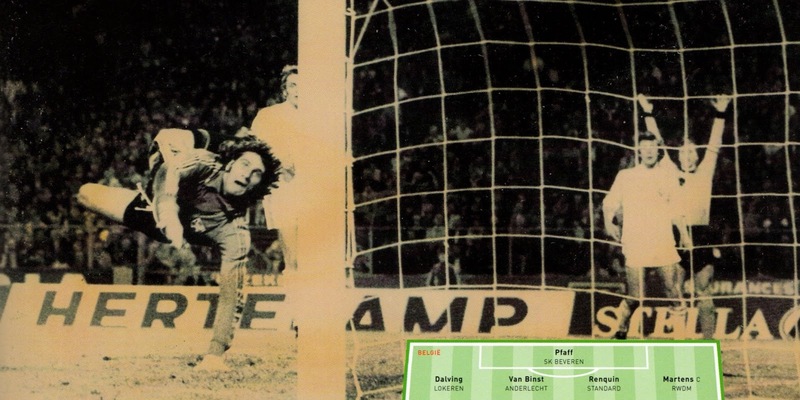 The normally dependable Manfred Kaltz was charged with the decisive kick. Pfaff rose to the occasion and saved the penalty kick and completely won over the crowd. After only a few months in Munich, he was regularly receiving 400 to 600 fan letters per day. 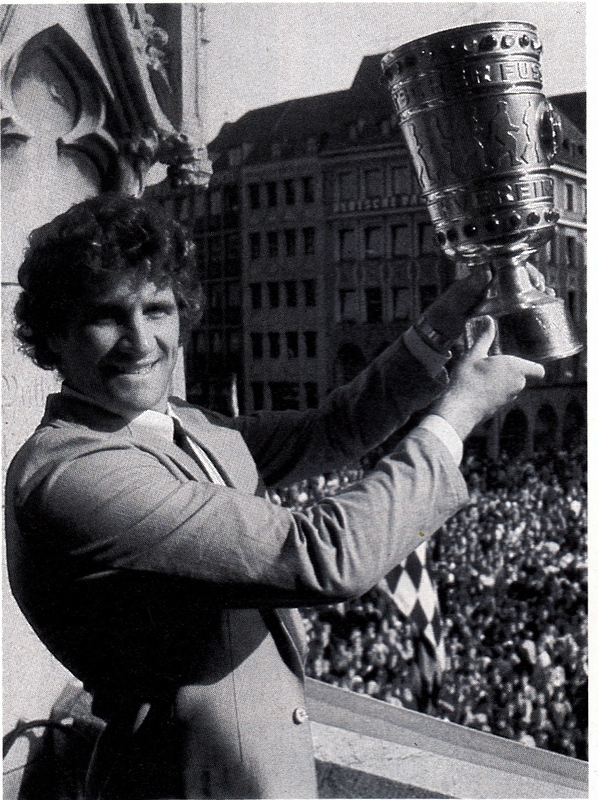 From then on the Bayern faithful would chant ‘Jean-Marie, Jean-Marie’ during matches. Many criticized his relations with media as shameless self-promotion. There was one occasion when Bayern teammate Wolfgang Grobe (who was also Pfaff’s neighbor) was being interviewed by a Football magazine. As part of their story they wanted a photograph of him in his backyard. Reportedly, Grobe had joked that they better hurry because Pfaff would be home in a couple of minutes and would also insist to be in the photograph (Pfaff later in an interview stated that Grobe had denied to him this exchange). Another point of contention of some of his teammates were his good relations with Bayern Manager Pal Csernai (that most players were opposed to). Despite these issues, in general everything seemed rosy for Pfaff at that point, who had also been impressed with the German discipline and work ethic in training. He was impressed with their Football mentality that included daily training of double sessions, indoor matches in winter and other Tournaments. He remarked that in Belgium he had time to work outside of Football but not in Germany, where one had to be fully dedicated to succeed. He even indicated his desire to extend his contract beyond his initial expiration date of June 1985. He also stated that he would want to stay in West Germany beyond his football career. 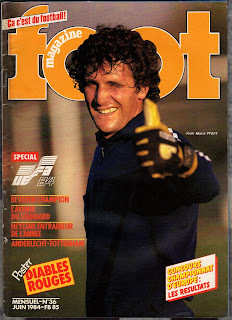 Such was his popularity in this first season, that when ‘Fussball Magazin’ conducted their monthly Interview (where fans sent their questions via mail), he broke the record of the number of letters received that had been set by Pierre Littbarski. When at the end of the year 1982, ‘Kicker Sportsmagazin’ designated Harald Schumacher as ‘World Class’ but Pfaff was designated the lesser status of ‘International Quality’, insults were sent to the magazine for this oversight. Koln goalkeeper Harald Schumacher would also become an arch nemesis in many ways. Pfaff like most had been outraged by Schumacher’s vicious foul on the Frenchman Patrick Battiston during the 1982 World Cup. He further harbored resentment when during the League match between their respective clubs Schumacher refused to shake his hand. He would view Schumacher with disdain for the rest of his Bundesliga career. At International Level, Thys had also forgiven him and he was back in the fold as a starter. Belgium were engaged in the Euro qualifiers in a Group with Scotland, Switzerland and East Germany and seemed on their way to qualify after winning their opening two matches vs. Switzerland and Scotland. 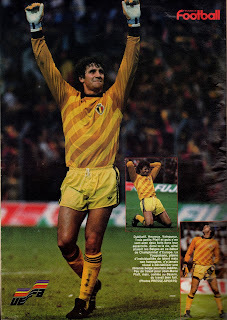 In the match vs. Scotland on December 15th, (3-2 Belgium win) he came to the rescue as he saved a penalty kick by Frankie Gray in the 78th minute. Pfaff believed that it was after this performance that his Belgian teammates finally ‘understood’ him after four years. He remarked how teammate Ludo Coeck acknowledged him and thanked him. At the end of the season, Italy’s Napoli were eyeing him for a possible transfer, but Bayern set his fee at three times his initial signing fee to ward off suitors. 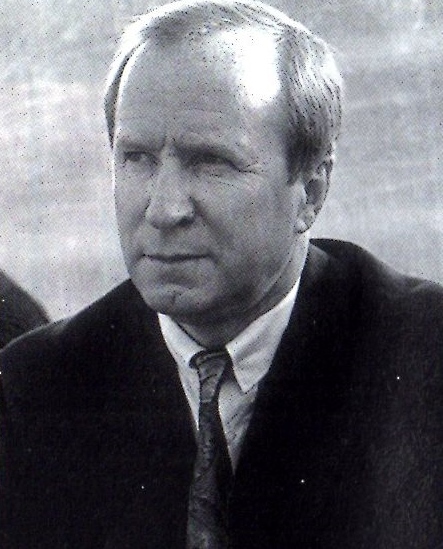 The following season (1983/84), Pfaff would have a new boss at Bayern as Udo Latteck was appointed to lead the squad. Pfaff would credit him for bringing back discipline to the squad. 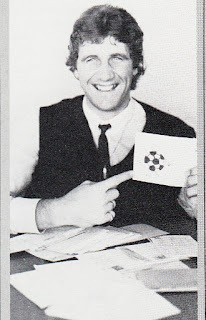 Pfaff’s popularity with the fans grew even stronger and it was estimated that by the end of the season, he was receiving up to 3,000 fan letters per week. The highlight of the early parts of the season would be in the UEFA Cup, in a match vs. Greece’s PAOK, he helped Bayern qualify in a penalty kick shoot-out. He saved PAOK’s ninth! attempt and scored himself with the ensuing kick to help Bayern advance. However, reports also surfaced that Pfaff felt he was cold shouldered by senior Bayern players such as Klaus Aughentaler and Wolfgang Dremmler. In an article he was alleged to have criticized his teammates by describing them as arrogant and overpaid. In another incident, Pfaff was celebrating his 30th Birthday in a Munich Restaurant in Munich with his teammates. However, the players were dismayed once they realized he had also invited reporters further underlining his reputation as a self-promoter. The familiar atmosphere of Beveren was in contrast to the cold reality of a club like Bayern. Pfaff believed that the team gradually came to understand and respect him on and off the field. Pfaff would win his first trophy with Bayern at the end of that season after they defeated Borussia Moenchengladbach in a penalty kick shoot-out after a (1-1) tie in the Final of West German Cup (DfB Pokal). 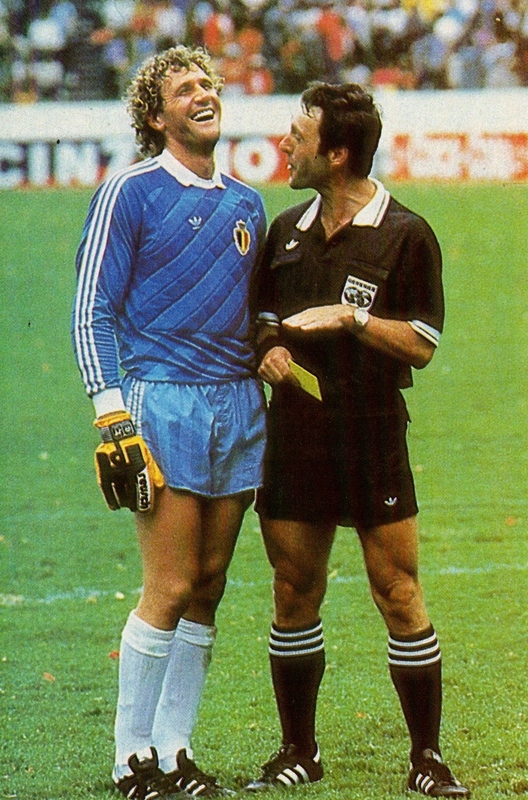 During the season, Pfaff would also earn his 40th cap vs. Poland (April 17th, 1984, 1-0 win) at Warsaw, which tied him with Piot as the most capped goalkeeper for Belgium. He also captained the side that day. Belgium had qualified for the Euros in the Fall; however, in the new year (1984) a scandal would rock Belgium Football that would adversely affect the National Team. 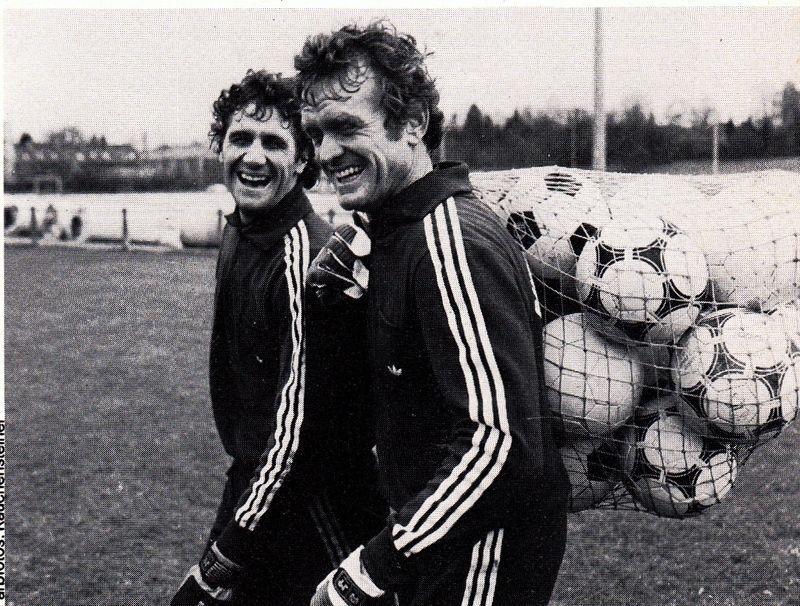 The Standard-Waterschei scandal would deprive Belgium of its Captain Eric Gerets and defensive partner Walter Meeuws. Thys would be forced to select a somewhat unprepared squad for the Euros. Many also questioned Pfaff’s mental strength for the Finals of a Tournament after his antics during the 1982 World Cup. Thys maintained confidence in his number one. Thys felt that for a short Tournament like the Euros (15 days), Pfaff is manageable; it is for longer duration Tournaments that he became difficult. Belgium won their first match in the Euros vs. Yugoslavia (2-0) but days later at Nantes, Pfaff and his Belgian teammates were completely destroyed (0-5) by a France squad with Platini at his best. Pfaff would once again come under scrutiny for criticizing his teammates after such a display, by Pfaff would insist that things had to be said. They still had an outside chance to qualify for the semifinals, but lost to a burgeoning Danish squad (2-3). The Euros had been a complete disaster for Belgium and Pfaff. As the new season (1984/85) rolled around Pfaff was beset by other problems. He missed the start of the season after a hernia operation. He was also involved in a traffic accident involving two nuns (tragically one of them was killed). At this point Pfaff was at his lowest ebb, not only physically but emotionally as well. The trauma of the accident was weighing heavily on him. Once again he would acknowledge the role of his wife Carmen who helped through this difficult period. Raimond Aumann and Jacques Munaron stepped in to cover for him at club and International Level. He also had to contend with the rumor of Bayern signing Harald Schumacher. To which Pfaff replied that Bayern would be spending more money and have controversy every week. The disappointed Pfaff at first asked for a transfer but Bayern’s General Manager Uli Hoeness refused his request. Pfaff trained hard and made his way back in the squad in November. He was on hand when Bayern Munich won the League title (and also reached the Final of the West German Cup). In all he played fourteen league matches that season. The following season (1985//86) he started well and was on hand as Belgium qualified for the World Cup at the expense of neighbors Holland. He was injured in November and had a lengthy time off and only returned to action in March. In the end Pfaff once again reclaimed his spot (playing 24 matches in the League) with excellent performances with Bayern and helped the West German club to a second successive Bundesliga Title (in fact as double as Bayern also triumphed in the West German Cup). The World Cup in Mexico would be a memorable one for Pfaff and Belgium. They came out from the first round without impressing much (Losing to hosts Mexico (1-2), defeating Iraq (2-1) and tying Paraguay (2-2)). Pfaff had already conceded five goals. It was in the second Round that the Belgians came alive to be one of the surprises of the Tournament. On June 15th, 1986, they faced the much-favored Soviet Union. They fell behind twice in the match but forced a tie. The match went into extra time and the Belgians took the initiative and defeated the Soviets (4-3). They were paired with Spain in the quarterfinals on June 22nd. Once again the match ended in a tie (1-1) in regulation time and had to go to extra time. The score remained the same after overtime and the match went into a penalty kick shoot-out. Pfaff came to the rescue by saving Eloy’s attempt (Spain’s second attempt) and help Belgium advance to the semifinals. It was said that when Belgian King Baudouin received the squad upon their return, Pfaff had jokingly asked the King whether the Queen Fabiola (of Spanish Origin) had held it against him for saving Eloy’s penalty kick. 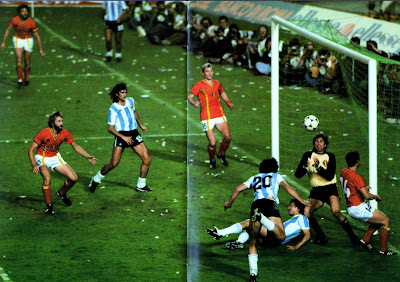 The semifinals were against Diego Maradona and Argentina on June 25th. 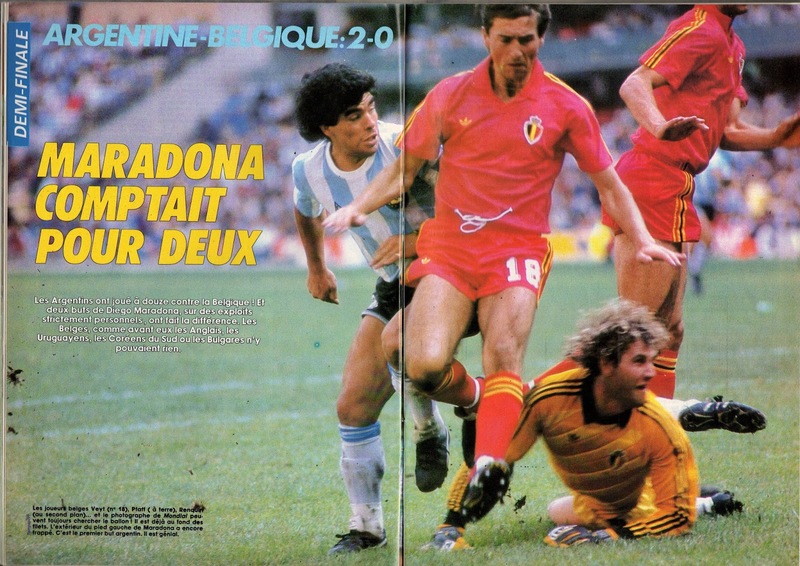 This time Belgium had no answer to stop Maradona at the top of his game in scoring twice for a (2-0) win. Pfaff would later express regret that the Team felt defeated before even taking the field vs. Argentina much like the attitude shown before the 1980 Euro Final vs. West Germany. All that was left was the third place match vs. France on June 28th (that also went to overtime after a 2-2 tie in regulation time). The more tired Belgians were resigned and were defeated (2-4). Nevertheless, this was Belgium’s best ever showing at a World Cup in no small part thanks to Pfaff. His performances in Mexico earned him the nickname ‘El Simpatico’. That same year (1986) his wax figure was unveiled at Brussels’ ‘L’Historium’ Museum. 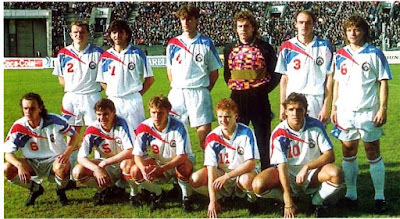 The new season (1986/87) did not start well as far as the National Team. Belgium were involved in the 1988 Euro qualifiers. On September 10th, 1986 at home, Belgium tied with the Republic of Ireland (2-2). Pfaff criticized teammate Frank van der Elst’s ability as Libero in the match. Thys promptly dropped him for Belgium’s next qualifier vs. Luxembourg on October 14, 1986. Jacques Munaron stood in for Pfaff in the (6-0) win. He regained his place afterwards for the rest of the season. He would have a better season in the daily grind of the Bundesliga. He clinched a third straight title with Bayern Munich at the end of that season (1986/87). In the Champions Cup, he had his best run with Bayern Munich that ultimately ended in disappointment as the much-favored Bavarians were defeated by Portugal’s Porto (1-2) in the Final. However, in the Semifinal Round, his performance vs. Real Madrid at the Bernabeu in April 2nd, 1987, is the stuff of legends as he kept at bay the rampant Real Madrid onslaught and limited them to a single goal (1-0 Real win) and elimination (after 4-1 win at Munich). It must be remembered that in those days, overturning deficits in European matches at Bernabeu was also part of the Football folklore. He performed his heroics that day despite being bombarded with projectiles from Real fans. He would praise the French Referee Michel Vautrot for keeping control of the match. Part of the Real supporters hostility was due to the fact that the day before the match Pfaff had indicated they would break the Bernabeu curse. Towards the end of that season, his rival Harald Schumacher at Koln released his controversial autobiography in which he accused many of his teammates of dope taking, etc. Pfaff called the book an absolute scandal and false. He remarked that after the ‘Battiston incident’ in 1982, Schumacher had been very lucky that his teammates had defended him. Instead he had written a book denouncing them as dope takers. At the end of that season, he re-signed for two more seasons and indicated his career was far from over and would like to continue until he was past the age 40. 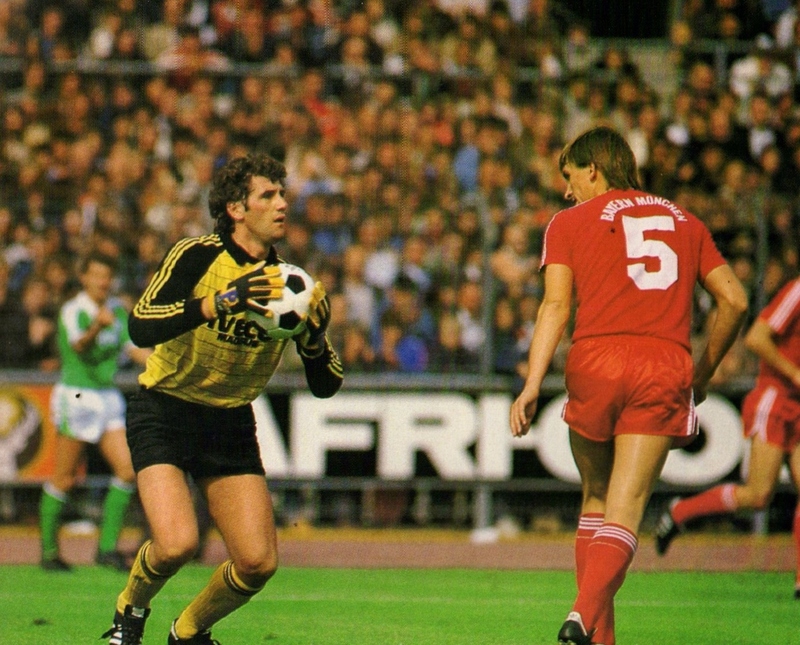 For his excellent performances that year, The International Federation of Football History and Statistics (IFFHS) elected Pfaff as the World Goalkeeper of the year 1987. Pfaff started his sixth and Final season with Bayern Munich for the (1987/88) season. It would be a difficult season for Pfaff for club and country. He would play his last match for the National Team in this season. This was in Belgium’s Euro qualifier at Sofia vs. Bulgaria on September 23rd, 1987. The loss (0-2) would be detrimental for Belgium who would eventually miss out on qualification. This was Pfaff’s Final and 64th cap after more than eleven years. All of his caps had been earned under Guy Thys. 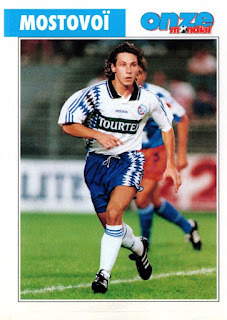 Michel Preud’homme would be installed as the new Number One. Pfaff believed that he was removed as Belgium’s starting goalkeeper due to commercial reasons. He felt the new Sponsors had forced the Management to remove him. He believed without this intervention he could have become the recordman of Belgian caps. The club season was also disappointing as Werder Bremen broke Bayern’s three-season stranglehold on the Bundesliga. This was the first season under the Management Jupp Heynckes following the departure of Udo Latteck. The writing was on the wall that this would be his last season as he was open to receiving offers. Manchester United had approached Bayern, but the fee was set too high. This was done without Pfaff’s knowledge and dismay. He believed all initial contact should go through his wife Carmen. He urged other clubs not to make the same mistake as Manchester United and contact him first. During the season Pfaff once more fuelled controversy by requesting his club to postpone his trainings on Sundays so that he devout Catholic could attend Mass. His Sister also passed away in the spring of 1988 to further compound on a negative season. Bayern Management decided to give Raimond Aumann his long awaited chance as the Number One for the upcoming season. They wanted to start a new cycle with new younger players and Pfaff was on his way out. Now in the declining stage of his career he decided to return home and joined modest side SK Lierse for the (1988/89) season to wind down his career. The Team finished in mid-table and at the end of the season Pfaff packed his bags once more to leave the country. He followed the example of his nemesis Harald Schumacher and joined the Turkish League by signing for Trabzonspor for the (1989/90) season. The fact that his former mentor Urbain Braems was the Manager there certainly helped his decision. 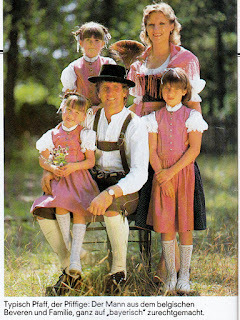 He tried to instill some of the traits he had learned in West Germany to help the team be more Professional and modern. This would turn out to be his final season as a Professional. He managed to reach the Turkish Cup Final with his club but they lost in the Final to Besiktas (0-2). Pfaff retired at the end of that season after nearly two decades as a Professional. He organized his Farewell Match at Beerschot in 1991. It was a match-up of the Belgium squad of the 1980s vs. a World XI Selection that included the likes of Franz Beckenbauer, Alain Giresse, Ruud Krol, Michel Platini, Soren Lerby and Roger Milla among others. 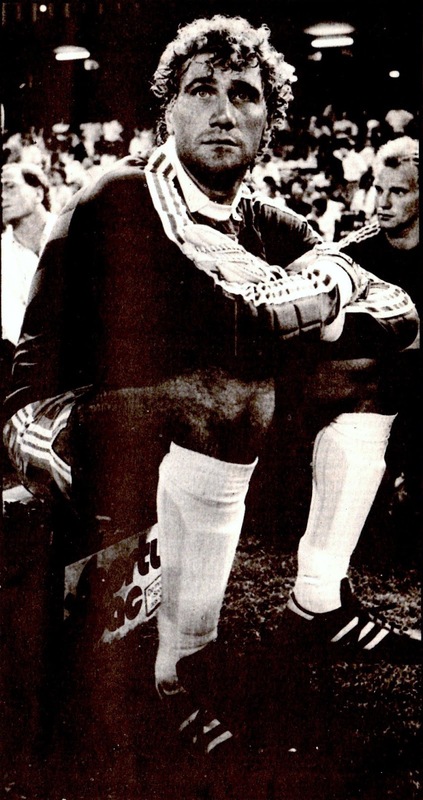 After his career he had stints as a Goalkeeping Coach at KFC Herentals and VfB Stuttgart. His only Head Managerial post was a solitary season at KV Osstende during the (1998/99) season that ended in disappointment. Clearly he was not made for Management. The ever entertainer he reveled in the new interest in Reality Television and starred in a Reality Show featuring his entire family (wife, three daughters and their respective families). The show called ‘De Pfaffs’ was successful and ran for eleven seasons from 2002 to 2011 and also made celebrities out of his three daughters: Debby, Kelly and Lyndsey. Jean-Marie Pfaff always remained amiable and loved by the public but not always with the critics, players and Management. He always remembered his difficult childhood and knew the value of hard work after having worked in a milk factory, the Post Office and even a Bank. He felt one should remain a friendly person even after they have achieved success. Those who knew him believed he would help anyone in need. His spell at Bayern had made him even more ‘Professional’ according to him. It had changed his attitude off the field in not only in matters concerning training but also Contracts, Sponsorships, etc. Of course it was this aspect that was largely viewed with skepticism by the media who only saw him as a publicity hound. Pfaff believed he was largely misunderstood especially from the Flemish Press. This was exemplified when he was elected as IFFHS’s World Goalkeeper of the year in 1987; he only received two votes from fellow Belgians. He had boasted that ‘there was Eddy Merckx in Bicycling, now there is Pfaff in Football’. While the critics found him arrogant, he felt his charisma had been vital in making Belgian goalkeepers noticeable in the International Arena and others such as Michel Preud’homme had benefited from his hard work. He was a ferocious trainer and his work ethic could never be questioned. He was a perfectionist whose ambition guided him to heights he never could have imagined. The indelible image that defines Pfaff was in a Bayern match that was played under pouring rain. At one point he went over to the stands and grabbed an umbrella from one of the fans and sat on a chair behind the goal. Pfaff believed that the Public paid a lot of money and his role is to entertain yet remain Professional.